Published Dec 19, 2013 by New Riders. Part of the Voices That Matter series. Anyone who uses Adobe Photoshop Lightroom for image management, editing, and workflow knows it is great software, and it has only gotten better with each new version. But there comes a time in every Lightroom user’s life when they want to do something…and they just can’t do it. While Lightroom covers the vast majority of a photographer’s needs–many say it covers roughly 80% of a professional imaging workflow–it just can’t do everything a shooter needs to put the final touches on a great image. 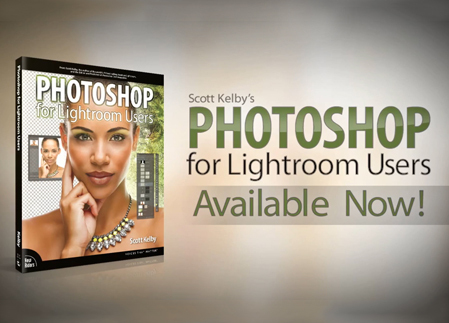 Scott Kelby, the #1 bestselling author of photography books, wrote Photoshop for Lightroom Users exactly for those Lightroom users who have recognized that they need Photoshop for the other 20% of their workflow, which will take their images to the next level. There is already a substantial audience for this book, and of course Adobe’s brand-new offering of a Lightroom and Photoshop Creative Cloud bundle for $9.99/month will certainly help grow this Lightroom-and-Photoshop audience very quickly in the coming months. These users don’t need to know everything about Photoshop. They just need to know the essentials edits, techniques, retouching tutorials, and tweaks that they can’t perform in Lightroom, but which will take their images up a notch. Scott covers everything from compositing to adding text over an image to retouching to creating a book cover to advanced sharpening techniques. With Photoshop for Lightroom Users, readers will learn all they need to know in order to fold Photoshop into their imaging workflow with Lightroom.